In 2009 a team from the Open University went to Nottingham to record some audio-visual material for a new course on Greek and Roman mythology. Part of the course focused on the sanctuary at Lake Nemi, where the mythical figure Hippolytus was said to have been taken by Artemis/Diana after he had been raised from the dead by the healing god Asklepios. 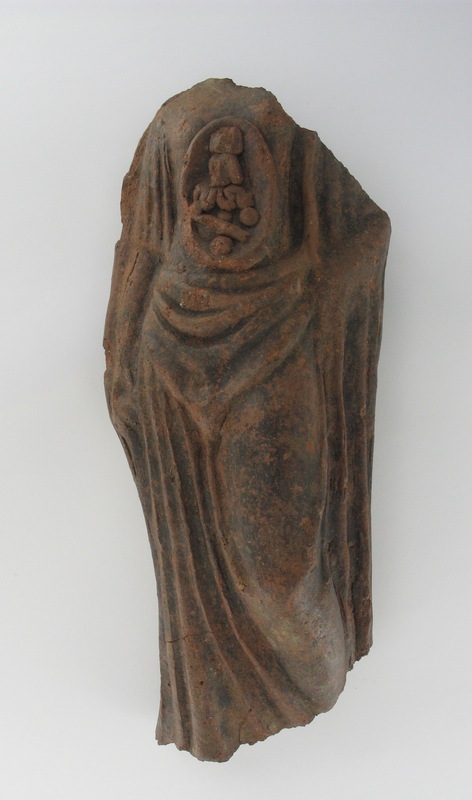 As an introduction to this site and its material culture, we recorded Dr Katharina Lorenz from the University of Nottingham talking about four objects in the Castle Museum collections: the famous herm of Fundilia, a terracotta oil lamp depicting a street entertainer, a terracotta votive model of a temple (which may or may not represent the temple of Nemi itself) and another votive model of a woman without a head, whose torso was ‘opened’ to reveal her intestines, rather like the later anatomical models used for teaching dissection to medical students. 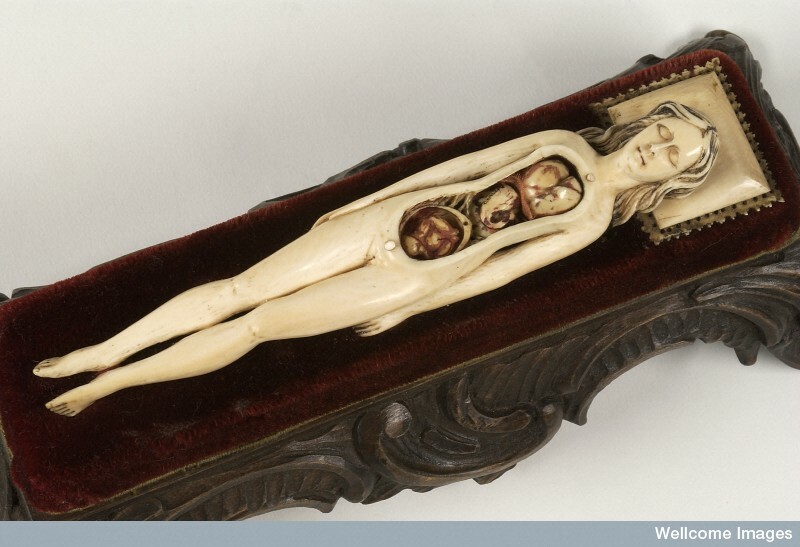 While each of the objects was fascinating in its own way, the ‘dissected woman’ was my personal favourite, not least because I was in the process of researching a book about ‘anatomical votives’ – models of the human body and its parts that were dedicated in ancient sanctuaries. The Nottingham figurine was one of the most unusual and striking examples of this phenomenon, and when I was invited to give a paper at a conference about votive offerings the next year, I jumped at the chance to go back to Nottingham to have another look at her. With the help of the Castle Museum curator Ann Inscker, I began to do some research into the various stages of this object’s ‘biography’, from its manufacture, dedication and subsequent disposal in a ‘sacred pit’ within the Nemi sanctuary, to its excavation by Savile in 1885, its journey from Italy to England, and its modern display in both physical and digital form. Needless to say, some stages of the votive’s biography were much easier to reconstruct than others. We could access quite a lot of information about the manufacturing process from a close visual analysis of the figurine itself, which was made in two parts – front and back – from reddish clay pressed into moulds that had themselves been made from another ‘prototype’ figurine. Examining the figurine also shed light on later stages of its life: for instance, the surprisingly good state of preservation suggested that the model had been placed gently amongst the other objects in the votive pit where it was discovered – rather than carelessly discarded, as people often think in relation to this sort of findspot. 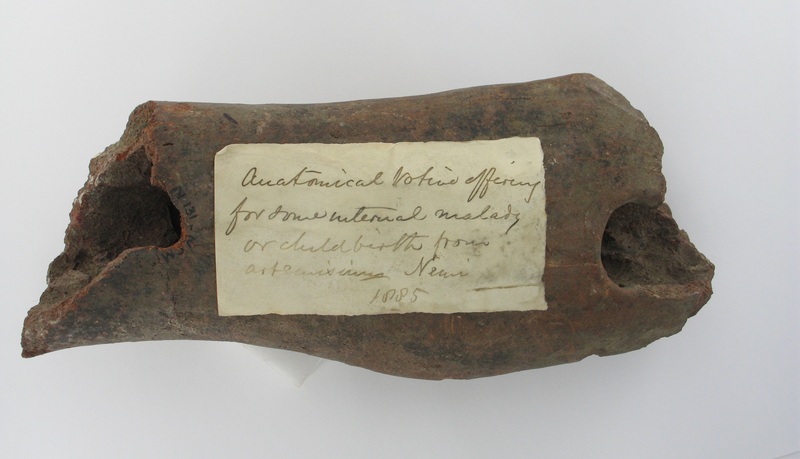 And of course, the handwritten label that had been carefully glued to the figurine’s back gave insight into nineteenth-century practices of excavation, recording and interpretation (the fading ink letters read ‘Anatomical Votive Offering for some internal malady or childbirth from Artemision, Nemi, 1885’). Further information about the figurine came from comparing it to other objects, both in and beyond the Castle Museum collections. One exciting moment in the research process came when Ann found another, previously-overlooked fragment of a figurine that was identical to part of the dissected woman, suggesting that there may have been more than one such model amongst the votives dedicated at Nemi. At other times, ‘general knowledge’ about anatomical votives from other sites in Italy helped to to fill in the gaps in the figurine’s own, inevitably patchy narrative. For example, while the dedicant of this figurine did not inscribe their offering with their name or any clue as to the motivation for their offering, other votive body parts from the ancient world do sometimes have inscriptions, findspots or other things that connect them to healing, making this a plausible interpretation for our figurine too. And while we have no trace of where this votive was dedicated and displayed at Nemi, the evidence from other sanctuaries can suggest possible locations – round the bases of the temple’s cult statue, for instance, or (as was the case at the nearby site of Lavinium) on the top of altars that were used for the performance of animal sacrifice. Roman relief from the Louvre showing haruspex (divinator of entrails, left) waiting to inspect after a sacrifice. Photo: Flickr aegean-blue. This mention of sacrifice leads on to what was, for me, the most compelling aspect of writing the figurine’s life story – that is, thinking about how its symbolic meaning changed and acquired different layers as it moved through history and across cultures. The more I looked at this offering in relation to its original context, the more I became convinced that the imagery of sacrifice had been deliberately evoked in order to add meaning to the object for ancient viewers. 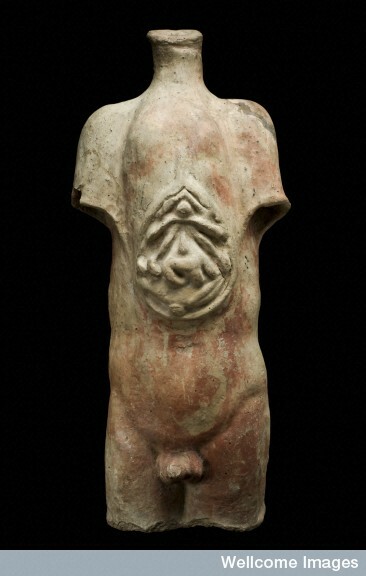 The iconography of the dissected torso bore many similarities to depictions of the sacrificial butchery of animals and the related ritual of prophesying the future from the appearance of the entrails. 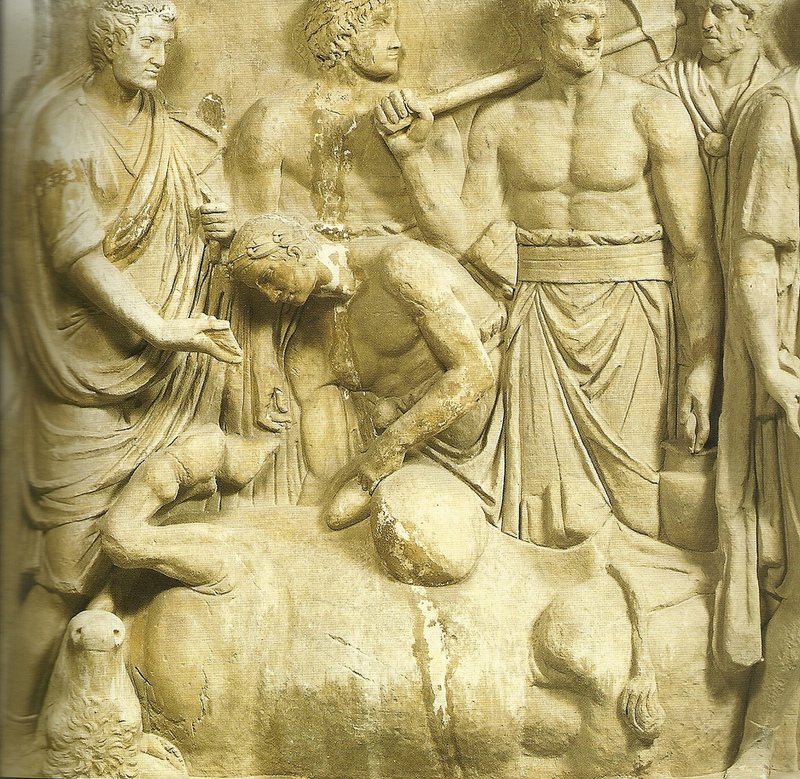 Meanwhile, other objects and narratives from the Nemi site related to human sacrifice, such as a now-lost marble relief showing the killing of the ‘Rex Nemorensis’ (complete with his ‘protruding entrails’, according to one nineteenth-century description). And human sacrifice lay at the core of the sanctuary’s own mythical foundation narrative, in which Orestes had rescued his sister Iphigenia from a life of sacrificing human victims to the Tauric Artemis before bringing her to Nemi along with that goddess’ cult statue. In fact, sacrifice and healing were closely linked concepts in classical antiquity, and it may be that the dedicant of the figurine was aware of this connection, using the figurine to represent his or her status as a sacrificial gift handed over to the care of the goddess. For later viewers far from the sanctuary of Nemi, these sacrificial resonances would have been less intrusive, and indeed most later commentators focus – as the author of the figurine’s label did – on the ‘medical’, healing function of the votive. When the figurine was included in the innovative virtual sanctuary created by the University of Nottingham it was represented alongside other anatomical offerings in a category of votives related to physical well-being. Here, the visitor to the site is given the opportunity to (re)dedicate votives from Nemi by sending them to another online correspondent for whom the votive might have meaning (in this case, perhaps a friend with tummy ache?!). This is a really good example of how later ‘receptions’ of votives can simultaneously take us away from, and draw us closer to, the original meanings and functions of votives. Here, the emailing of a votive to a mortal rather than a divine recipient seems like the ultimate act of secularisation; however, at the same time, it also potentially restores to the votive some of its empathic, emotional and transactional qualities – qualities that have often been sidelined in academic and antiquarian discussions. I haven’t yet been to the new exhibition to see how the dissected lady has been presented, but I’m really looking forward to going and updating my object biography with this latest stage in the figurine’s story. 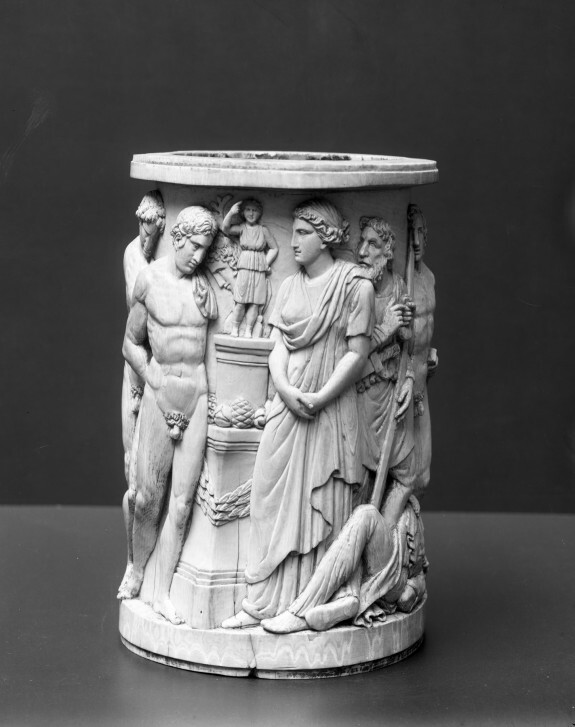 In the meantime, our OU students continue to enjoy looking at and hearing about the different votive objects from Nemi, and discovering how the ritual practices surrounding Diana can complement (and sometimes complicate) the rich body of mythological narratives about the goddess of Nemi. The Anatomy of Ritual is Dr. Hughes’ forthcoming book on ancient anatomical votives. Keep up to date on blog posts by following our Twitter and Facebook pages.